The name and the life of Giorgio Vasari (1511 - 1574) are closely intertwined with the history of the Uffizi. The Tuscan artist projected and built the Uffizi Palace, which was terminated after his death. The Tuscan artist, born in Arezzo, was also the author of the Vasari Corridor, which joins Palazzo Vecchio to Palazzo Pitti, and takes its name from its author. Vasari started his artistic career in Florence, at Andrea del Sarto\'s workshop. Later, he worked in Rome, for Cardinal Ippolito de\' Medici. The Vasari\'s art opened the Mannerism season, that followed the period of the Renaissance. In 1550, the first edition of one of his most famous works was published: The Lives, a collection of biographies of Italian architects painters and sculptors. Still today, even though we know that many information are not true, the Lives are read and appreciated. In the mid-fifties of the sixteenth century, his great Florentine period began: Vasari moved to the city and worked for the Duke Cosimo de\' Medici. For Cosimo, Vasari worked in Palazzo Vecchio: he restored some parts of the building and painted the frescoes in the Salone dei Cinquecento. He began work on the building of the Uffizi. Originally, the palace was intended to house the administrative and judicial offices of the city. In 1565, Vasari began to work on the Corridor: Cosimo had bought a new residence, Palazzo Pitti, on the other banks of the Arno, and asked the artist and architect to create a private walkway for the Duke family. In the same period, Vasari inaugurated the Accademia e Compagnia delle Arti del Disegno, which was very important for Florentine art. 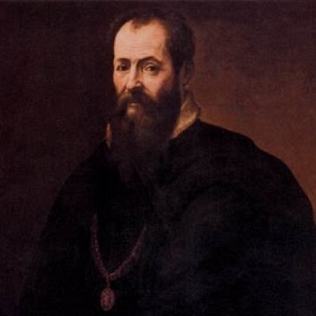 Vasari continued to work in Rome, for the popes, obtaining important art commissions. At the same time, he increased the content of his Lives. He died in Florence on June 27th, 1574.